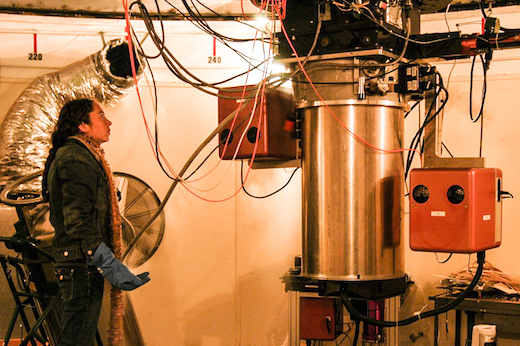 During the summer between her freshman and sophomore year of college, all DTM Hubble fellow Jacqueline Faherty knew she wanted was a job that was going to pay well, which can be difficult to come by in academia. Then, Jodie Foster came into Faherty's life. She watched her play a female science lead in the film "Contact" and Foster's strong, assertive, and passionate performance inspired Faherty to return to school that fall and switch majors immediately to astronomy. Since then, Faherty has become an advocate for women in science and is now doing research that she hopes will set the stage for the next phase of exoplanet studies. We asked Faherty about where her passion for astronomy and science education comes from, and what research she will be pursuing at her next job as a faculty member at the American Museum of Natural History in New York City starting in August 2016. 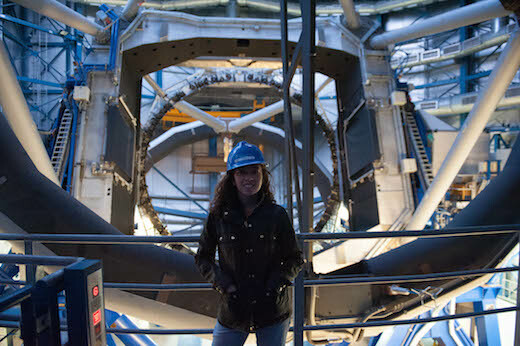 Jacqueline Faherty standing in front of one of the 8 Meter Class Telescopes at the Cerro Paranal Observatory in northern Chile. Photo Courtesy of Jacqueline Faherty. Jacqueline Faherty: I started thinking I wanted to do astronomy pretty late in life. It was the summer between my freshman and sophomore year in college. At that point I was pretty committed to the idea that I wanted a job that was going to pay well. Academia in the best of situations, rarely falls in that category. However, then I watched the film Contact. It featured a female science lead, something I had never seen before. She was strong, assertive, and passionate about astronomy. It inspired me to return to school and immediately switch majors (despite the advice of academic advisors). I've never regretted it. Faherty: At no point have I ever been bored with astronomical work. Every day I get to pursue a mystery (large or small) that the Universe has presented to Earthlings. I look at data that--many times--has only ever been seen by my eyes. Faherty filling the dewar at the MDM telescope at Kitt Peak Observatory in Arizona. Photo courtesy of Jacqueline Faherty. DTM: What research projects have you been working on at DTM? Faherty: This is my final year at DTM. For the past three years I have been focused on understanding a special sample of objects called brown dwarfs that are strikingly similar to giant exoplanets. Brown dwarfs differ from stars in that they do not have enough mass to sustain nuclear burning. They differ from giant exoplanets because they lack a host star that they orbit. The special sample that I study are identical in almost all properties to the handful of planets that we have directly imaged. I take images and spectra of them and look for signatures of the chemistry in their atmospheres. We are using this special sample of brown dwarfs to create the ideal comparative library for understanding the diversity of large giant planets in the nearby solar neighborhood. Faherty gave an invited review talk on the properties of brown dwarfs at the exoplanet mass boundary at the Cool Stars meeting this past summer 2016 in Uppsala, Sweden. Photo courtesy of Jacqueline Faherty. Faherty: I hope that the research I am working on now sets the stage for the next phase of exoplanet studies. Until recently we have only been studying and detecting giant exoplanets indirectly. We see their impact on the host star (like how Jupiter tugs on our Sun ever so slightly) but rarely do we get a glimpse of what the planet looks like. The objects I study are isolated. Whether they got to their positions because they formed that way (likely) or whether they got there because they were ejected from a planetary system (less likely) is unknown. Regardless, we can study them in beautiful detail now. In the coming years, there are several instruments and missions that will allow us to directly probe more planets orbiting nearby stars. The sample that I have been working on will be instrumental in putting the temperature, age, mass, and atmospheric chemistry of the observed planet into context. 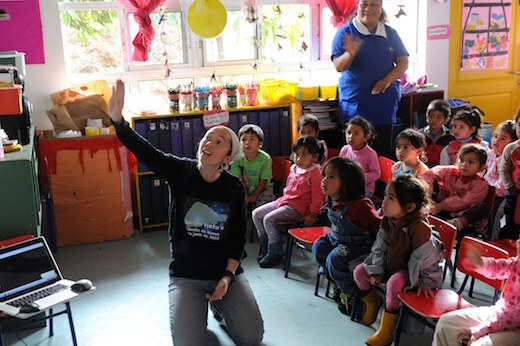 Faherty explaining the solar system to small children on Easter Island, a Chilean territory, at an outreach event she organized surrounding the 2012 transit of Venus. Photo courtesy of Jacqueline Faherty. Faherty: I will be leaving DTM at the end of August 2016 for a faculty position at the American Museum of Natural History (AMNH) in New York City. My new job will be a hybrid research and education position. At present, I co-run a research group at AMNH called "The Brown Dwarf New York City" research group, or BDNYC, along with two other female scientists (Kelle Cruz of Hunter College and Emily Rice of the College of Staten Island). We have numerous postdoctoral, graduate, undergraduate, and high school students that work with us. I've been advising students remotely from DC for the past three years but will now return to the heart of our scientific team. I will also be taking on a number of new and interesting education outreach opportunities at AMNH. I will be teaching in the Masters in Teaching (MAT) program and will advise the NASA Science Research Mentoring Program (SRMP), the Bridge Up program, and several other new urban initiatives. Faherty: I want to see my academic future contain a rich mixture of high-end research endeavors and giving back to the public through outreach and science communication. I hope to see my research team flourish with more graduate students and postdocs working on the cutting edge of comparative exoplanet studies. I also want to make a difference in the urban NYC environment by bringing astronomy to students who would not likely encounter this field. 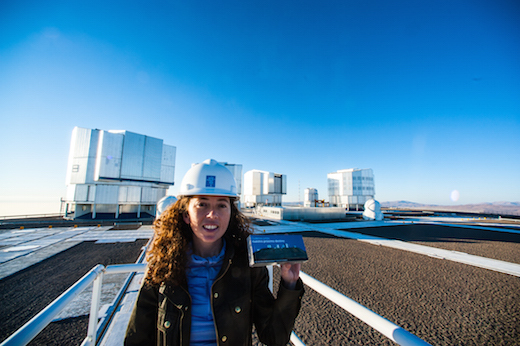 Faherty outside the Very Large Telescope (VLT) at the European Southern Observatory on Cerro Paranal in the Atacama Desert in northern Chile holding a snack box from the LAN flight that had taken her there that has the caption "Your next destination" printed on the cover. Photo courtesy of Jacqueline Faherty. DTM: Any other interesting anecdotes about yourself you'd like to share? Faherty: I'm a big advocate for women in science. My mother was from Puerto Rico and came from a family with three other sisters. On that line, I'm the first woman to have received a bachelors degree let alone a Ph.D. I think both my mother and at least one of my aunts would have made amazing scientists. They both became nurses and had a passion for the medical field. Unfortunately, they lacked role models (female as well as hispanic) and encouragement to pursue the sciences. I've made it a goal to help change that for the next generation of young girls (specifically targeting hispanic girls). I am a council member on the American Astronomical Societies Committee for the Status of Minorities in Astronomy (CSMA) and in 2010, I started a 501 c non-profit foundation called Raising Awareness in Science Education for Women (RAISE-W). I strongly believe that finding mentors early in your life or career can completely change your attitude about academia, hence I will constantly strive to help younger counterparts see and achieve their scientific dreams.